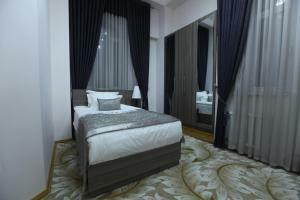 Lotte Palace Dushanbe is a popular choice amongst travelers in Dushanbe, whether exploring or just passing through. Offering a variety of facilities and services, the property provides all you need for a good night's sleep. Service-minded staff will welcome and guide you at Lotte Palace Dushanbe. Designed for comfort, selected guestrooms offer flat screen television, carpeting, children's high chair, cleaning products, clothes rack to ensure a restful night. The property offers various recreational opportunities. Friendly staff, great facilities, and close proximity to all that Dushanbe has to offer are three great reasons you should stay at Lotte Palace Dushanbe.